Laminate flooring has been popular for generations as a simple, affordable and easy-to-clean means of achieving any type of look for the floors in your home. So what is it, and how can you install it in your property? 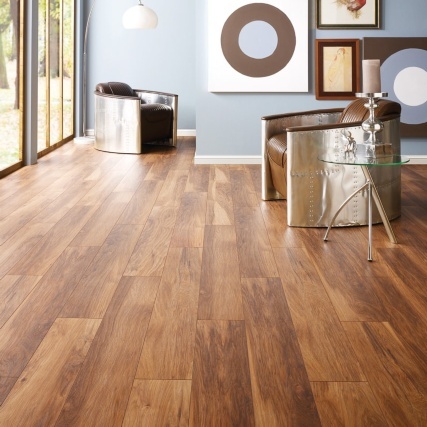 Read on for B&M’s simple guide on how to lay laminate flooring yourself. A clear, occasionally textured, protective top layer, usually made from resin, that protects the material and design underneath. The next layer down is printed with a natural-looking reproduction of whatever style you prefer, from wood grain to marble to terracotta tiling and beyond. The final third layer is usually made of tough High Density Fibreboard, and supports the rest of the structure from below. 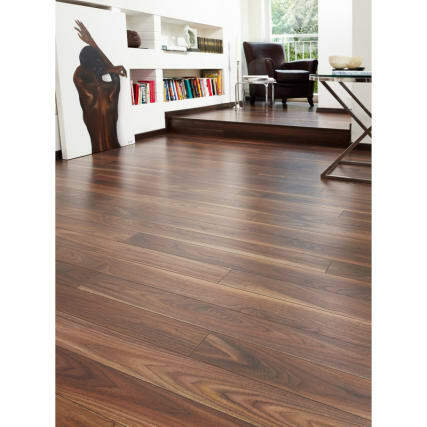 Generally, laminate flooring is between 6mm and 12mm thick. Laminate flooring click systems are one of the most common designs that offer an easy method of laying this type of surface. The sections fit together like a jigsaw - simply slide them into each other at a slight angle and then lay them flat so that the joints hook together properly. Here’s B&M’s step-by-step guide on how to fit laminate flooring. 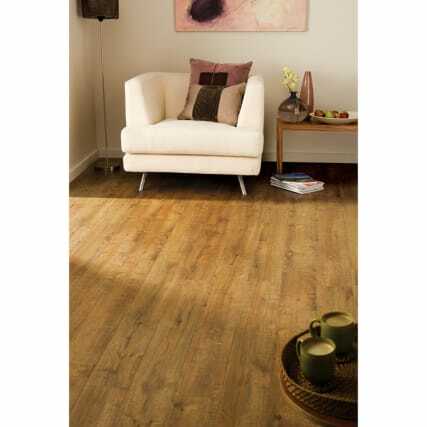 Your choice of laminate flooring, laid flat for 48 hours or more. Before you start, be sure to protect your eyes and mouth with goggles and a mask, as getting chips or sawdust from laminate flooring in your eyes or down your throat can be very damaging to your health. Measure the space you wish to cover with laminate. You need to be very careful when doing this, as a mistake can mean considerable amounts of wastage! Always triple-check your measurements. When deciding on how to install laminate flooring, be sure to take into account any alcoves and obstacles that the material will need to fit around. It’s always a good idea to ensure that you add 5-10% to each of your measurements, as it’s better to order too much laminate than too little! Carefully remove skirting boards (you’ll put them back later). 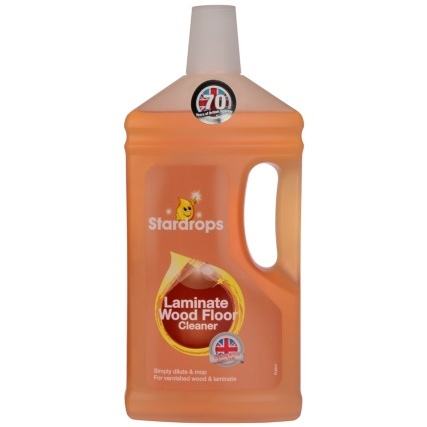 Make sure the floor surface is as clean and even as possible. It should also be perfectly dry, with no damp or leaks. Lay the damp proof underlay and stick all of the pieces together with masking tape, creating a gap of around 16mm around any pipes or wires that are in the way. Calculate how much flooring you’ll need, bearing in mind that you will need a board of 100mm wide at each side of the room. Cut the laminate boards to size, creating straight pencil marks as guidelines with the help of your set square. B&M Top Tip: Make sure there’s a gap of between 8 and 10mm between the flooring and the wall, as there’s a strong possibility of some expansion. As you’re laying the laminate boards, keep an eye on the design on the surface. If it’s designed to look like floorboards or tiling, be sure to stagger the boards in the correct way. They should adhere to the process typical of laminate flooring click systems, so each piece should fit neatly together. Tap the final edge of the laminate into place carefully with your hammer. Make sure no walls, pipes or other obstacles are touching the flooring. The best way to cut laminate flooring to the shape you want is to use a simple handsaw if you need to cut right across the board to trim it down. Draw a straight pencil line to guide your saw, then make sure both the piece you wish to keep and the piece you’re cutting off are well-secured. Try to keep the line you’re sawing as close to the edge of your workbench as you can to stop the material from bending or snapping. You can also use a jigsaw, which is perfect for cutting shapes to fit around obstacles. Make sure the blade you use is as fine as possible for a neat cut. 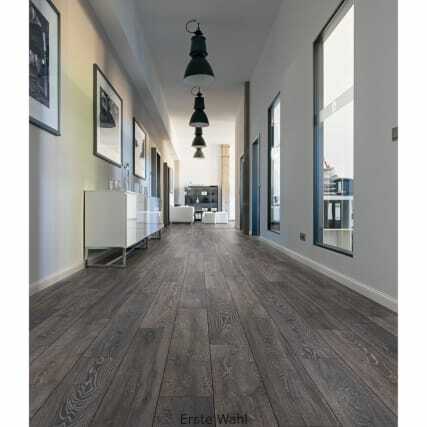 B&M Top Tip: Don't forget you can find a wide range of laminate flooring at your local B&M store, in a variety of stunning designs and contemporary colours and effects. Enjoy your beautiful new laminate flooring and be sure to share the results with the B&M Community via Twitter, Facebook or Instagram.